This is kind of awesome and kind of not: Darkest Days, an original, hour-long zombie horror film done entirely in Source Filmmaker. The creator is Danny Field. 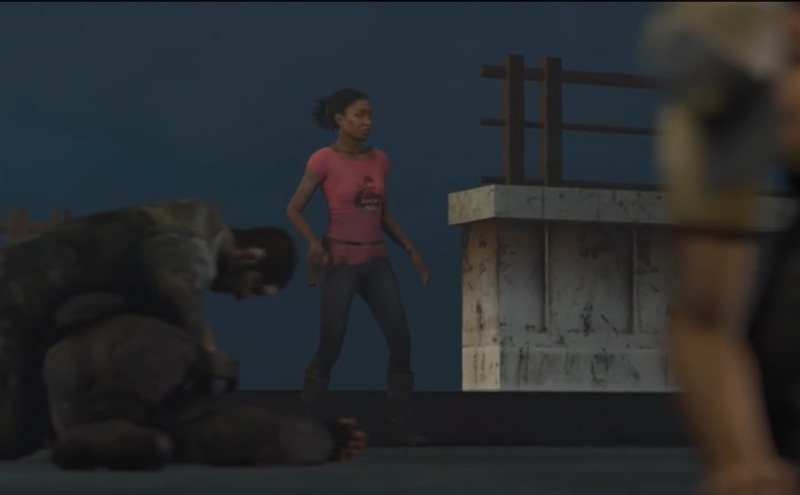 Field creates his own environments but uses the characters from Left 4 Dead 1 and 2, plus a bunch from Half-Life 2. It’s also largely his own zombie apocalypse: no safe rooms, no healh packs, no infinite ammo, and no specials… on the other hand, the regular zombies are pretty buffed. Where’s your melee weapon, girl? His most unusual decision, however, was to make it a musical. A heavy metal musical. So the characters periodically burst into song. Sometimes the zombies sing along. This is… OK, this would probably make for a great riffing movie. Still, it works as well as any musical, and you gotta admit that metal makes an appropriate soundtrack for a zombie film. certainly more so than, say, lounge. If you can accept a zombie apocalypse at all, you can accept a musical about one. So, I was pretty much with him for about the first half hour. Two brothers, who are given different names but are Ellis and Nick from L4D2, head out scavenging for supplies and find a largeish knot of survivors. They mostly survive one horde onslaught, and then have to face a decision: head for the docks to hope for a ship rescue, or back to the city to hole up? And then…. well, I could swallow the metal interludes, but what really grated on me is that none of the characters seem to have played Left 4 Dead. Seriously, these people are total noobs. Their characteristic move is to stand in the middle of an open space blasting away at the zombies as they arrive. They don’t even bother to look behind them, and the zombies ultimately move in and get them. They have no idea of cover, of defensibility, or of teamwork. And then we’re shown what happens to the people who head back to the city. They manage to arrive, no problem, and then they’re all surrounded and eaten. Within the course of one song. Field had been building some narrative tension to this point, but here he pretty much gives it a shotgun to the gut. And then… this turns out to be not very subtle foreshadowing. Everybody dies at the end. I guess this is common in horror, but that doesn’t mean it’s a clever choice. I may be wrong here, but I think “everybody dies” works better either in a short form (where it’s less of a downer) or a very long one (where your attachments to the characters give the deaths greater meaning). But let’s not end on a downer! I found this by chance, browsing Source Filmmaker films I’d missed, and it grabbed my attention pretty well. Check it out to see what people are doing with STM these days.